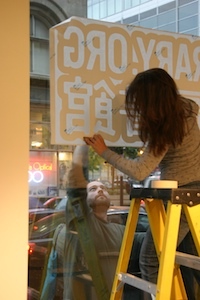 Thanks to Lee Moreau for graphic design donated in-kind to the Storefront Library. Lee also connected us with Mark Andreasson’s firm Design Communications Ltd (DCL) which donated fabrication and installation of our new nine foot window sign. Angela Exposito & Adam Lawson of DCL came out this morning and installed the new sign with good humor and exacting attention to detail. It looks stunning, and the library staff are excited to see the storefront taking shape.